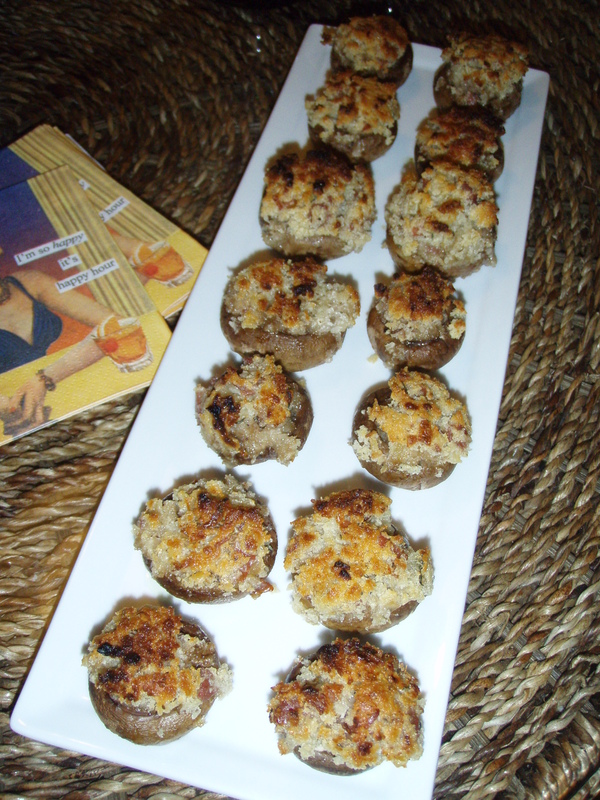 In reading several new cooking books and magazine recipes, I’ve run into a lot of variations on stuffed mushrooms. Most all of the recipes include cheese and breadcrumbs. From there, people tend to add what ever they like – sausages, meats, herbs… or what ever they think is particularly trendy or in season. For me, it is what ever is about to go in my fridge. Again, in my spring cleaning I noticed that I still had some Goat Lady Dairy cheese leftover in my fridge from Kat and my trip to the Curb Market a couple weeks ago. I needed to use the cheese and thought this would be a good excuse to experiment with stuffed mushrooms. Like I mention in my warning below – I’m no baker – I hate to measure – so if you do – you have been warned. Warning: If you like to use measuring cups – this recipe is going to annoy you. Assembly: Clean and remove the caps from a big tub of mushrooms (either button or cremini work). Saute the garlic and shallot in olive oil until brown. In a large bowl, mash up a small log of goat cheese. Add a couple pinches of fresh thyme, the garlic and shallots and the prosciutto. Mash together. Fold in a handful or so of breadcrumbs. Taste and season with salt and pepper. Stuff the mixture into the mushrooms and lightly drizzle with olive oil. Bake for about 30 minutes at 350. At the last minute, I broiled the mushrooms to make sure they were brown and crispy on top. Next Chick Pea Salad with a Kick!